ForkliftCertification.com gives your business a smart, safe solution to all your forklift test needs. Without a well-trained forklift fleet, you’re rolling the dice. And OSHA is always looking out for safety violations. Plus, forklifts can be a very hazardous vehicle, especially when operated by someone without proper credentials. The statistics are sobering (and staggering), but they bear repeating. Approximately twice per week, someone dies as a result of improper forklift practices. There are thousands of serious accidents (and many smaller, unreported instances) every year. It’s easy to see why an OSHA-compliant forklift certification test is so critical to you and your co-workers. Don’t take chances with your forklift safety program. If all of your employees or co-workers aren’t certified by OSHA, your company could be looking at severe fines and penalties. ForkliftCertification.com offers a trio of forklift certification tests designed for forklift operators of any skill level. With our training content and forklift written test questions, you’re prepared to handle job challenges in a safe, measured manner. 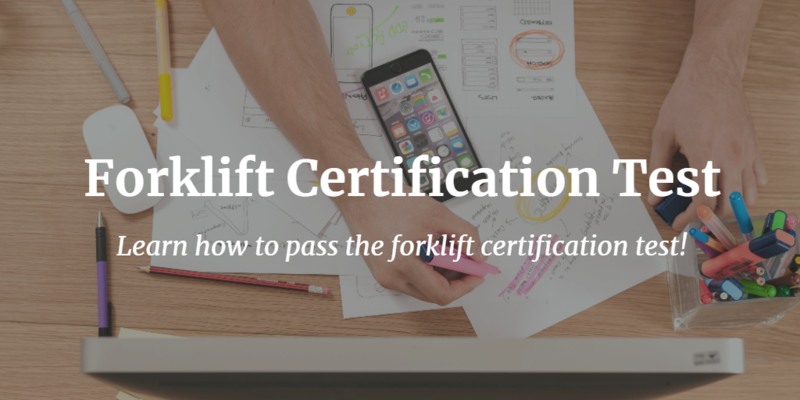 What is a forklift certification test at ForkliftCertification.com, why is it important, and how can you get started today? Let’s review our OSHA compliance training, what you need to know about our forklift certification test questions and more. WHAT IS A FORKLIFT TEST? An OSHA forklift test will determine if a worker is qualified and has the knowledge to operate forklifts. The forklift training program teaches employees what they need to know to operate a forklift properly, inspect the equipment, assess the environment, and recognize and avoid hazards. It is mainly a forklift safety test that ensures workers are capable of helping to prevent accidents in the workplace. The forklift certification test questions cover everything from operating and inspecting the equipment for any hazards to how to properly handle a load and how to navigate a warehouse including driving on ramps and around blind spots. The written forklift training test and practical led by a trained supervisor confirms the competency of the worker and qualifies them as ready to operate equipment in a safe manner. ForkilftCertification.com has the training you need to get everyone OSHA compliant – sign up today! What is Involved with the Forklift Certification Test? The forklift training test is made up of two parts: a written test and a practical skills test. The written test follows formal instruction that is completed online, from any device with the internet. Forklift certification test questions focus on the different parts of forklift safety, like traveling with a load, using horns and other warning signals to alert other workers, doing equipment inspections, and so on. The second part of the OSHA forklift certification test is the in-person evaluation. This involves you, the student (your employee), and a qualified trainer who will lead this for you. Your employee must pass this OSHA forklift test to receive their operator certificate. It consists of the actual operation of a forklift, starting with the trainer to demonstrate and followed by practices performed by the student. The trainee is always being supervised during this evaluation, and it’s performed in an area where no other people are in danger. The qualifying forklift certification test covers both forklift-specific and workplace-related topics. Once trainees have passed both the written forklift test and the skills forklift training test, they will be able to print their operator card and begin work! They will be certified and compliant with all OSHA forklift test requirements. ForkliftCertification.com is here to help with written test, skills test, and onsite evaluation. With our training packages, you have everything you need to become OSHA compliant. Not only is a forklift test crucial for improving the safety in the work zone and helping to prevent accidents but it is also an essential tool for limiting liability, decreasing the risk of fines, and reducing the amount of costly equipment repairs for the employer. These all add up to fewer costs for you and increased productivity. OSHA guidelines state that all employers are required to provide their workers forklift training. This involves forklift certification tests, written test questions, and more. Do you have the resources to handle this training alone? Most companies don’t – that’s why they rely on the OSHA experts at ForkliftCertification.com to provide forklift certification tests and all related content. When you choose the OSHA forklift certification test from ForkliftCertification.com, you are also ensuring your employees are OSHA-compliant and up to date on the latest safety protocols. The forklift test questions will make sure that you’re letting only those who are knowledgeable in forklift safety to operate your machines. And the best thing is, all of your OSHA compliant training can take place in less than one hour! Do Workers Need Refresher Training and Testing? According to OSHA, workers must receive refresher training at least once every three years to remain updated on safety practices. However, if an operator is involved in an accident or near miss, is caught acting unsafe on the forklift, or, if a new forklift is being used or the workplace changes to affect safety, workers must immediately be given re-training and a new forklift test. Traditionally, forklift training was a major hassle for companies looking to become up to date with the latest OSHA forklift test regulations. In years past, many firms tried to “go it alone” and administer their own training courses. This was a costly and very time-consuming undertaking. Many employers weren’t sure if they were including all of the important forklift test questions needed to properly qualify workers. Other businesses would let an OSHA forklift certification test “expert” handle their forklift training test needs. And while this method took up less time, it was extremely expensive. But since 2002, ForkliftCertification.com has been the preferable third way. Since our staff includes professional forklift drivers and safety experts in all matters related to OSHA, we take care of the details so you don’t have to. Our online forklift certification tests are the best money can buy. And once your drivers have completed their course, and passed all forklift certification test questions, official papers are only a few clicks away. It’s that simple – and inexpensive, too! We also always provide 3-year renewal certificates free of charge if your workers completed their initial forklift test with us. Each of our three training programs offers high-quality information and all necessary forklift test questions to be compliant with OSHA forklift test standards and the most effective for operators. With these programs, you will be sure to pass your forklift training test with flying colors. Forklift Train the Trainer – The Train the Trainer course teaches already-certified forklift operators how to deliver information to new workers and prepare them for operating forklifts safely. You can have more control over what and how your new employees are trained, and can save valuable time and money with your own in-house educators. Forklift Training & Certification Kit – The Forklift Training & Certification Kit teaches new workers the fundamentals of operating a forklift, including how to maneuver around corners, blind spots, and ramps, and how to perform equipment inspections. Students will also learn how to recognize and avoid hazards to lead to injuries and fatalities every year. The program is compliant with OSHA regulations and provides you with well-trained employees who have successfully passed all forklift certification test questions. Forklift Certification & Training Bundle Package – Our Bundle kit combines the training program with our Train the Trainer course to save you money if you have workers that need to be certified and have a passion for helping others. We also provide free three-year forklift certification renewals. Are you planning on taking a forklift training test? Learn more about our forklift certification test content, study tips and more from ForkliftCertification.com! To get started on your forklift certification test, contact us today. If you have any questions about our OSHA forklift test, call us at (888) 278-8896, or check out our contact page to request a quote, access more information and learn everything you need to know about the OSHA forklift certification test. ForkliftCertification.com is the top online provider for your forklift training test needs. ForkliftCertification.com is your one-stop shop for Forklift Certification Tests and Forklift Training Tests! We teach and test workers on Warehouse Forklifts, Pallet Jacks & Order Pickers, and Rough Terrain Forklifts. You can purchase the specific training course you need, or get all three with our Training Kit. We’ll help your forklift drivers become OSHA compliant and fully trained with thorough content and expert-level instruction. And the testing is completed in less than one hour! No other training company is as efficient and affordable as ForkliftCertification.com. Thanks for visiting our website – we look forward to helping you improve your workplace and achieve your goals with the best quality training programs and forklift test guidelines.